Press Release: Six young Scottish female golfers are to savour the opportunity of a lifetime as part of the handover ceremony for The 2019 Solheim Cup coming to Scotland, the Home of Golf – after launching their own bid to qualify for the PING Junior Solheim Cup. Through the support of the Scottish Government, VisitScotland, Scottish Golf and the Ladies European Tour, the female group have been selected for a dream trip to this year’s Solheim Cup at Des Moines Golf & Country Club, taking place in Iowa from 18 – 20 August. The initiative was borne from a Whatsapp group started by some of the girls following Scotland’s successful bid to stage The 2019 Solheim Cup. Entitled #Project19, the group began as a way of the girl’s motivating each other to climb the amateur golf rankings and qualify to represent Team Europe at the 2019 PING Junior Solheim Cup, taking place at Gleneagles. Now Hannah Darling (Broomieknowe), Rachel Foster (Turnberry), Eilidh Henderson (Kirkcaldy), Evanna Hynd (Balbirnie Park), Carmen Griffiths (Aboyne) and Anna McKay (Crail Golfing Society) will all experience the thrill of the biggest team event in female golf, before the baton is passed from the US venue to Gleneagles for the 2019 staging over The PGA Centenary Course. The Scottish Golf Academy players, all but one of whom have come through the ClubGolf national junior programme, will engage with Team Europe at the PING Junior Solheim Cup, work with the VisitScotland team on stand producing blogs and other media content, experience the excitement around the event where Scotland’s Catriona Matthew is a vice-captain and form a part of the handover ceremony to Gleneagles and Scotland for the 2019 event. 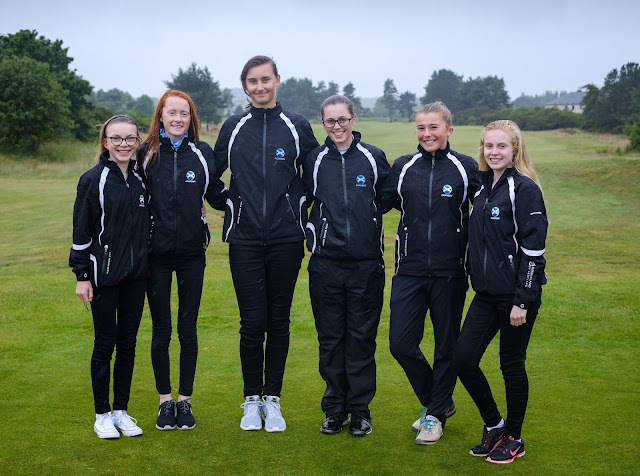 In a further thrill, the six girls will also be part of two Pro-Am teams competing in the star-studded Ricoh Women’s British Open at Kingsbarns Golf Links on Tuesday 1 August, offering them a superb opportunity to gain valuable experience in a professional environment. Following the inception of the #Project19 Whatsapp group, Scottish Golf identified players who have come through national programmes to benefit from such a life-changing opportunity. The players will stay in accommodation with the rest of the Team Scotland party and take away lifelong memories , underlining The Scottish Government’s stated ambition to use The 2019 Solheim Cup to help grow golf among younger age groups and increase participation. The Scottish Government and VisitScotland have been long-time supporters of the women’s game having partnered with the Ricoh Women’s British Open for many years and, this year, significantly enhanced the Aberdeen Asset Ladies Scottish Open as it becomes a co-sanctioned LET and LPGA event for the first time. Scottish Golf is also working hard to grow female participation at all ages in Scotland, notably through the successful ClubGolf and Get into Golf programmes. The 2019 Solheim Cup, incorporating the PING Junior Solheim Cup, is to be staged at Gleneagles from 9 – 15 September and will also not only showcase the stunning assets of Scotland, the Home of Golf, but also build on the legacy of the successful 2014 Ryder Cup at the renowned Perthshire venue.